On the first day of spring semester, hundreds of first years packed into Vollum lecture hall to hear the inaugural lecture of the new Hum 110 curriculum. Similar to the first lecture of last semester, the room was vibrating with a sense of possibility and apprehension. English and Humanities Professor Nathalia King lectured on the Mexica empire (called Aztec by the Spanish). Professor King’s lecture began by introducing students to Tenochtitlán (the capital of the Mexica empire) and the trajectory of this quarter’s curriculum. 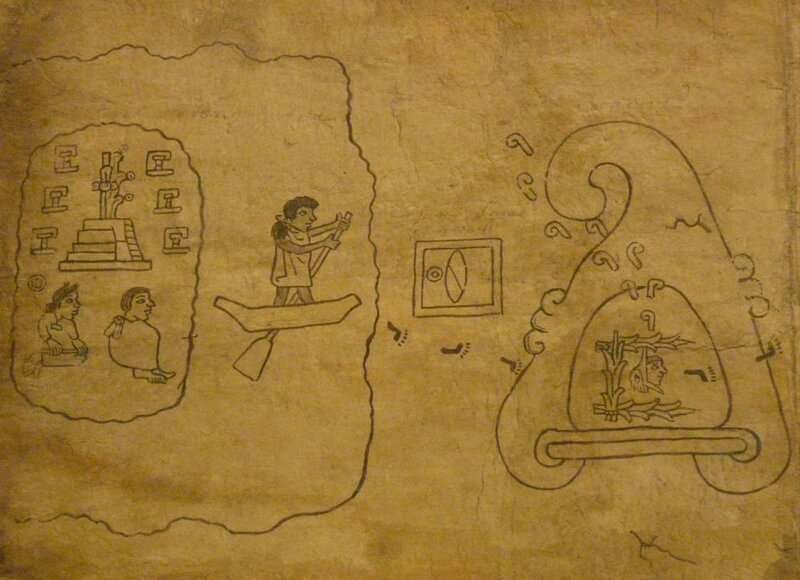 She then discussed the homework: selections from the Codex Mendoza and the Tira de la Peregrinación (also known as the Boturini Codex). Professor King provided crucial insight on how to understand the source material. Because the Mexica did not have a written language, much of the material was paintings consisting of pictographs and calendrical glyphs. Professor King’s lecture provided a strong base for conference and the readings that followed. For Wednesday, January 30, first years read selections from the Codex Mendoza, the Florentine Codex, and Bernal Díaz’s The Conquest of New Spain, among others. Professor of History and Humanities David Garrett gave a lecture on Mexica cosmology and metaphysics. Professor Garrett explained that all material on the Mexica empire was written after the fall of Tenochtitlán to Spanish colonizers in 1521. Also, many of the accounts of the Mexica were written by the Spanish; because the Spanish had a fundamentally different understanding of the world, their writings of the Mexica society are flawed. On Friday, February 1, readings covered the Spanish conquest and destruction of Tenochtitlán. There was a reading from the Spanish perspective, Bernal Díaz’s The Conquest of New Spain, and one from the Mexica perspective, We People Here: Nahuatl Accounts of the Conquest of Mexico. There was no lecture on that Friday, however. Looking forward in the syllabus, approximately every other week there is a day without lecture. Associate Professor of Philosophy and Humanities Paul Hovda explained that there are many different reasons for this change, including that some Hum 110 faculty believe that having less material will allow for more time on each piece and create deeper analysis in conference. As for my experience, it doesn’t feel that different from last semester. I (and I suppose many other first years) have less background knowledge of the ancient Mesoamerican than the ancient Mediterranean world, so I’ve found lectures to be more important than ever. Other students seem to agree: lectures have been packed full of Reedies (but we’ll see if that lasts past the first few weeks). Plus, the homework sometimes includes a brief introduction to the readings written by the Hum faculty that I’ve found very helpful. Overall, I’ve enjoyed the new Hum 110 curriculum and I’m excited for the future.